In late August 2015, a friend and I drove our RV to Weyburn SK to take a course with Martha Cole. 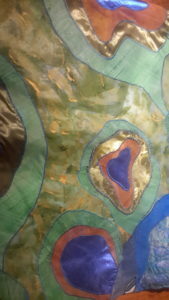 The theme of the workshop, ‘All Beings Confluence’, would provide us with some new ideas for working with sheer fabrics. Of course the intent was for us to complete these panels within the five day workshop and leave them with Martha for the travelling exhibition she has assembled. However, as usual, my concept was too complex for completion within the five days! Not only that, smoke from the forest fires in Washington State was blowing into Southern Alberta and Saskatchewan and the smoky air got the better of me. For the last couple of days I struggled with breathing problems. As a result the project came home and has spent the last year in a half in a bag, moving from one spot to an other in my tiny studio/sewing room. As usual, I often look for a UFO (Unfinished Object) to get me moving in the new year. This year I decided it was time to complete the panel. Two and a half days of work later it is basically complete. As I look at the photos I realize I forgot the glitter in the eye! 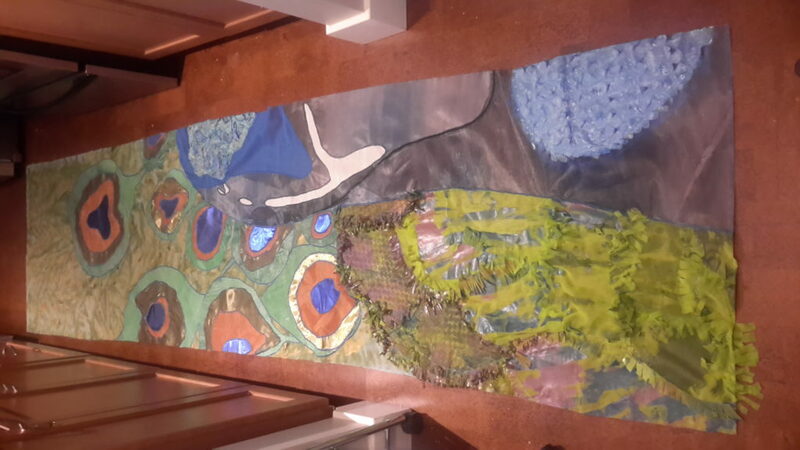 It is just under 10 feet in length, and as a result it has been difficult to photograph. For the photo to the left the panel was hung from the upper level by the stairs in our condo building and the lighting was not great. The colours in the detail shots are closer to the actual colours. Photographed from the top of a step ladder under artificial light, the colours are more realistic. I tried it against a window and the colours disappear although the design is interesting.When it is hung, the panel is intended to be viewed with top lighting and spaced with others that ‘flutter’ as you walk through them. I’ll have to wait until it hangs somewhere to get a good photo. The panel is two-sided and is the same when viewed from either side. This was part of the complexity of this panel construction. Simple applique would not work so each design element needed to be inserted into the background fabric. Even the textured inserts have texture on both sides. The fabrics are painted polyester sheers and metallic fabrics. I had hoped that it would be effective when hung in a window but the light overpowers the colours in the panel. Metallic fabrics are not sheer so had to be doubled so that they would reflect on both sides. Lots of learning with this piece! More information about Martha’s project, All Beings Confluence can be found on the website. A search on the web turned up a link to this press coverage from the Edmonton Journal. Peacock panel under artificial light.